The Xiaomi Mi Drone 4K needs no introduction; it is one of the best value-for-money Ready-To-Fly camera quadcopter on the market today. It features a strong yet light aircraft body comprised of foldable landing gear and removable camera/gimbal, making the quadcopter easier to carry. Since June 2016, I’ve performed countless trouble-free flights with my Hubsan H501S quadcopter, always enjoying stable and trouble free GPS flights, especially on my vacations since the H501S is quite portable and ideal for carrying around in a bag – long before the DJI Mavic Pro – therefor I had it almost every day with me capturing the moment. So, one can imagine my excitement when I was contacted from Banggood to test the Hubsan H501A: a massive upgrade of the H501S to support digital video downlink and application control featuring advanced flight modes like waypoints and missions. The Eachine Aurora 100 is a 100mm frame Quad X quadcopter, suitable for intermediate pilots that want to try doing FPV flying and stunts. The platform is based on the popular SeriouslyPro Racing F3 flight controller and comes with integrated OSD, video transmitter and power distribution board (PDB), all neatly packed on a cube-type frame. The board comes with BetaFlight v3.1.1 pre-flashed and configured. Regarding the receiver, three options are available: DSMX/DSM2, FrSky and FlySky. It is a bind-and-fly (BNF) solution, the only thing needed is a compatible transmitter. RCMoment.com DJI Mavic Offers for March 2017. 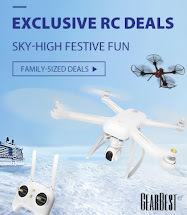 Awesome deals on DJI products for Greek and EU customers. Links and coupons are valid until 3-March-2017 or until stock is depleted, so you better hurry. All Phantoms are shipped free of charge with DHL express (delivery in 1-3 business days). Don’t forget to read about the new shipping methods provided, so that you’ll get the best shopping experience.